‘A car to go almost everywhere. Do almost everything. A new breed of car.’ Those are the opening statements from a vintage commercial about the long running Ford Mustang. Being first launched in 1965, the pony has been around now for 53 years and shows no sign of slowing down, continually morphing into new and better designs. The two cars on show here are a 1965 Mustang Fastback with a 289 ci./4.7L V8 engine with four speed manual transmission and a 2018 Mustang Fastback GT Featuring a 302 ci./5.0L V8 with six speed manual transmission. The unique thing here is that the video was made by UK motorcycle outfit Krazy Horse and shot on UK roads. The leafy surroundings and sedate weather (aka it is raining most of the time) give a different landscape to the usual sunny backdrops or cityscapes common to most Mustang scenery. 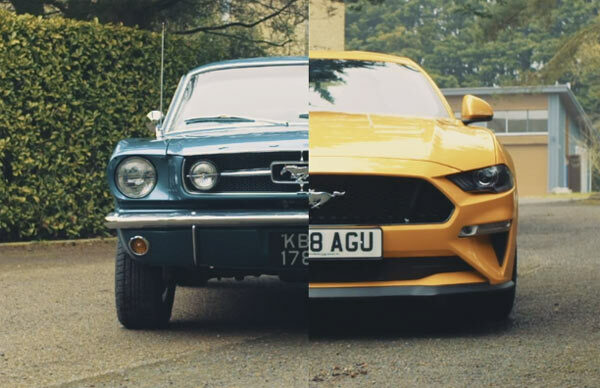 If you’re a fan of the Mustang, this is a beautifully shot video and gives a nice comparison between the old and the new. Me wonders what the Mustang will look like in another 53 years – Electric, hover car, space Mustang?? Mustang Vs Mustang – Krazy Horse from Krazy Horse on Vimeo.